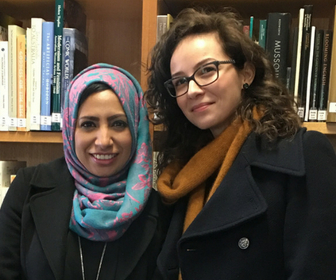 The Australian Academy of the Humanities is delighted to announce that Dr Raihan Ismail of the Australian National University and Dr Ana Tanasoca of the University of Canberra are the joint recipients of the 2018 Max Crawford Medal, Australia’s most prestigious award for early-career researchers in the humanities. The Medal was established through a bequest made to the Academy by the late Professor R.M Crawford OBE FAHA, and is awarded to an Australia-based, early-career scholar whose research and publications make an exceptional contribution to the understanding of the humanities by the general public. This is the third time in its history that the Medal has been awarded to two outstanding early-career researchers in the same year. This year’s recipients are both scholars whose cross-disciplinary approach to their research has resulted in work of distinct originality and excellence, and whose projects are notable for their public accessibility and national significance. Dr Ismail is currently a lecturer at the Centre for Arab and Islamic Studies at the Australian National University. Her research interests include Islamic theology and Arab culture, Sunni-Shia relations, women in Islam and Middle East politics. She is the author of Saudi Clerics and Shia Islam published by Oxford University Press in 2016. Through her ability to translate complex theological and social issues for a general audience she has connected her research to public debates on Islam and Muslim societies, appearing on the ABC’s Q&A and in other media outlets. Dr Tanasoca is a postdoctoral research fellow at the Centre for Deliberative Democracy & Global Governance at the University of Canberra. She has broad interests across moral philosophy, ethics, and analytic normative political theory, in topics ranging from enfranchisement to climate change. Her book The Ethics of Multiple Citizenship, to be published by Cambridge University Press later this year, is remarkably timely. Dr Tanasoca is engaging with current debates about the ethical and political problems that accompany dual citizenship and questions of multiple citizenship. For over a quarter of a century, the Max Crawford Medal has been awarded biennially to outstanding humanities researchers at the earlier stages of their careers, working across a range of disciplines and institutions. The Max Crawford Medal is awarded following a rigorous process of assessment. For the 2018 round, the assessment process began in April this year. A list of previous recipients of the award is available on our website. In order to further recognise and foster the outstanding work being undertaken by the future generation of humanities scholars, the Academy will award the Max Crawford Medal on an annual basis starting in 2019 to coincide with our 50th Anniversary celebrations. Details of the next round of nominations will be posted on our website in February 2019. The Max Crawford Medal will be formally presented to the recipients in November as part of the Academy’s annual program of events in Sydney.